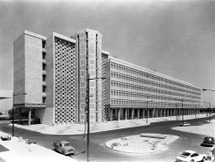 Stimulated by the euphoria around the commissioning of Mies van der Rohe for the construction of the New National Gallery 1962 in Berlin, Hans Maria Wingler, founding director of the Bauhaus Archive, asked Walter Gropius, the founding director of the original Bauhaus, if he would like to design a building for the Bauhaus Archive. Gropius who had always been fully conscious of the high publicity value of buildings could not refuse. Provided by Wingler with a plan of a building site on the Rosenhöhe in Darmstadt, he designed a complex presenting a slightly deferred H-formation adapted to the plot's slope. Gropius proposed to light the exhibition space through shed roofs. Wingler accepted the plan unconditionally, but was politically unable to carry the project through. He had chosen the summit of the highest rise in Darmstadt for the building site. The city's officials deemed this too prominent a position for a newly-founded institute still in the process of defining its profile. On one of his frequent visits to Berlin, however, Gropius succeeded in awakening building Senator Rolf Schwedler's interest in the Bauhaus Archive. At the suggestion of the Senate, the Bauhaus Archive moved to Berlin in 1971 with the guaranteed permission to realise the building planned by Gropius. Of the three alternative building plots available for the project, Gropius chose the plot situated next to the Landwehrkanal which, in contrast to Darmstadt, was entirely flat. The necessary changes to the plan were carried out by his former colleague Alex Cvijanovic, in conjunction with the Berlin architect Hans Bandel. This process of adaptation turned out to be difficult and took up a lot of time. Drastic changes ensued as a result of political decisions and financial cutbacks. 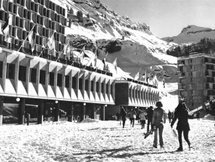 In 1976, the cornerstone was finally laid for a building that in general plan and silhouette was to be very close to the design of 1964. Important aspects, however, had radically changed. Thanks to the simple structure, the construction advanced rapidly and the keys were handed over to the institution in January 1979. Housed in a remarkable building in Tiergarten, the Bauhaus Archive/Museum of Design in Berlin was constructed to a modified design by Bauhaus founder Walter Gropius. This is the most comprehensive collection documenting the history and impact of the Bauhaus movement, also known as Bauhaus Workshop, founded by Walter Gropius in Weimar. The specialist library is stocked with over 26,000 books, journals and catalogue material as well as manuscripts, letters and a variety of publications. A Cafeteria and Bauhaus Shop are on site. The Audio Tour is available in many languages. Despite the relatively short period of time in which it operated (1919-1933), relocating from Weimar to Dessau and then to Berlin, it became one of the 20th century’s most influential schools of architecture, art and design of the 20th century and its aesthetic vision and educational philosophy never lost its special reputation. Illustrious Bauhaus movement members included Paul Klee, Wassily Kandinsky, Lyonel Feininger, Oskar Schlemmer and Laszlo Moholy-Nagy. Among the exhibits are numerous objects and some icons such as the Bauhaus lamp and the Wassily chair, as well as 250 utility objects designed for home and office. The Bauhaus ideal of combining all the arts in an ideal unity had aimed to eradicate the distinction between fine and applied arts and some of the first prototypes for the technological mass reproduction of objects can be seen here. Paintings, drawings, sculptures and models are among the works bequeathed by Walter Gropius, Herbert Bayer and Lucia Moholy. Special exhibitions explore a variety of Bauhaus themes and history.